This was the first commercially available recording I appeared on as part of The Bernie Torme Band, released in 1977. I'd first got together with Bernie in November 1976 having heard through Mark Harrison's grapevine that there was this Irish guitarist living in Richmond who, apparently, played like Jimi Hendrix and needed a rhythm section. After a phone call or two we arranged to go and see Bernie at his flat (with me complaining all the way there about having to hump my bass with it's case all the way from Great Portland Street to Richmond on the tube!!! ), jammed a few of his tunes and the BTB was born. Bernie had exclusively dedicated his life to playing music for some time and for me and Mark this was to be step up. I was, at the time, still in a 'safe' job at Lloyds Bank City Computer Centre in Cannon Street and really needed that push to take the plunge into the unknown and risky world of being a 'professional' musician with no guarantees and very little security. Bernie was to provide that push and motivation ... hahaha it's all his fault!!! Bernie had a guy, 'Uncle' Peter Collins, who agreed to be our manager and, with Peter's help, we started getting gigs at the known pub rock venues in and around London. I remember at the time my main ambition was to play at The Marquee in Wardour Street or even make it to the heady heights of The Rainbow in Finsbury Park. I'd already played two numbers at The Marquee in The Melody Maker Rock/Folk Contest semi-final in 1975 with a band called 'Breadheads' (which included Dave 'Dzal' Martin on guitar ... look him up!!! Still a friend to this day!!!) but that was just a passing taste of glories yet to come!!! Sometime around April/May of 1977 we all cut off our hair, sped up the music, started using speed and jumped straight onto the 'punk rock' bandwagon!!! The result of which can be heard on this album. I remember that I was taking 'black bombers' at the time, trying to get the gigs done in and around my shifts at the computer centre and just staying awake the whole time. I mean, two BB's i didn't blink for two days!!! I had started using drugs to get me through (before, I'd considered myself a recreational user) and there was no shortage of weird and wonderful coloured pills and dodgy powders available. Most of my peers and heroes used one thing or another and I thought it was cool. It also masked my feelings of inferiority and inadequacy and gave me the confidence to perform, a behavioural pattern that I was to rely on in my life and career all the way up to going to rehab in 2005. 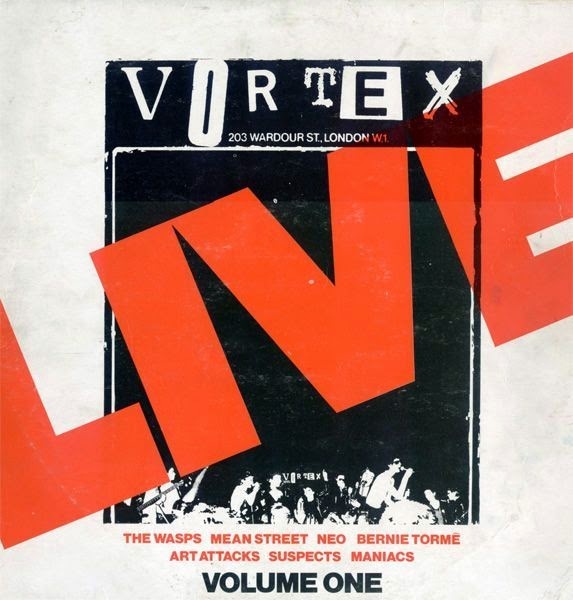 The Vortex album was a punk 'cash-in' album following in the footsteps of the Live At The Roxy album, showcasing second generation 'punk' bands. Recorded live at The Vortex club in Wardour Street during late summer 1977. Musically, the two tracks we have on this album represent the way I had learned to play at this particular time which was a mixture of the influences of Phil Lynott from Thin LIzzy and Roger Glover from Deep Purple on 'Living For Kicks' and Jean Jacques Burnel from The Stranglers on 'Streetfighter'. I played my 1966 slab-bodied Fender Precision which had once belonged to John Entwhistle of The Who, who I got to know in 1994 on the Daltrey sings Townshend tour. John told me that he'd had three of these particular Fender Precisions in 1966-67 (out of a known 25 that came into the country) and mine was one of those that had been smashed up (no surprise there!!!) during a Who gig. Someone had subsequently put this bass back together (with glue!!!) and I'd bought it from a second hand shop next to Clapham Common in 1973 for L125. I've since had it disassembled, un-glued, refinished and put back together in as close to it's original form as is possible AND ... it still sounds particularly unique for a Fender Bass. John used to say that the slab-bodied Precisions had a high-end distortion for some unfathomable reason and, yes, that's still true of mine today. Not a great instrument for recording but live, through a substantial rig, a monster sound!! !